Irene Glezos and Todd d'Amour in Orpheus Descending. Photo by Ride Hamilton. The tale of Orpheus, the mythical musical prodigy who went into the underworld to rescue his wife Eurydice, has inspired several plays, but in my mind Tennessee Williams's version is the most interesting. While Sarah Ruhl's Eurydice easily presents itself as mythical, I often forget that Williams's Orpheus Descending is based on the same characters. 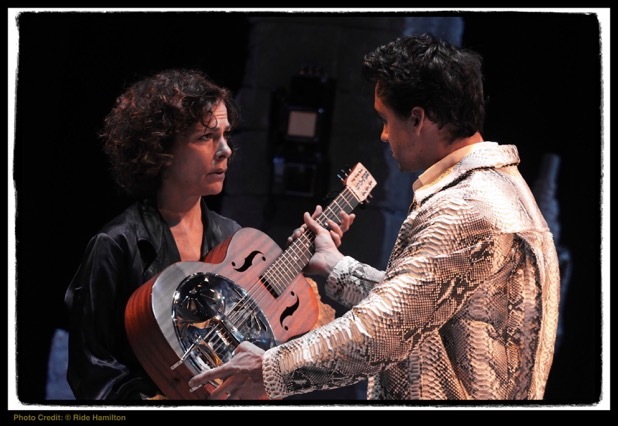 When I saw the recent Southern Rep production in New Orleans, directed by Jef Hall-Flavin, Val's immortal guitar was lowered down to the stage like a gift from the gods, a reminder that these characters are not entirely of this world. A few weeks after that, Val and Lady and the rest of the cast of Orpheus Descending are performing a new version of the play directed by Austin Pendleton in St. John's Lutheran Church on Christopher Street. On a lovely spring night, I stepped inside of the church, ready to follow Williams's Orpheus again. The first thing I noticed is that the mythical and religious aspects of this play have different resonances with stained glass renderings of Jesus in the background. The space is both intimate and resonant, a fitting place to hear Williams's musings on life, death, love, and fate. Orpheus Descending was one of the first Williams plays I read, and the first outside of the "big three" of The Glass Menagerie, A Streetcar Named Desire, and Cat on a Hot Tin Roof. I was immediately drawn to some of the fantastic lines in the piece, and to the character of Lady, who takes a chance on a musical drifter trying to make something of himself. I even memorized some of Lady's lines. Perhaps I feel the need to tell you a bit about my own journey to this production because the production's journey has been so fascinating to me. 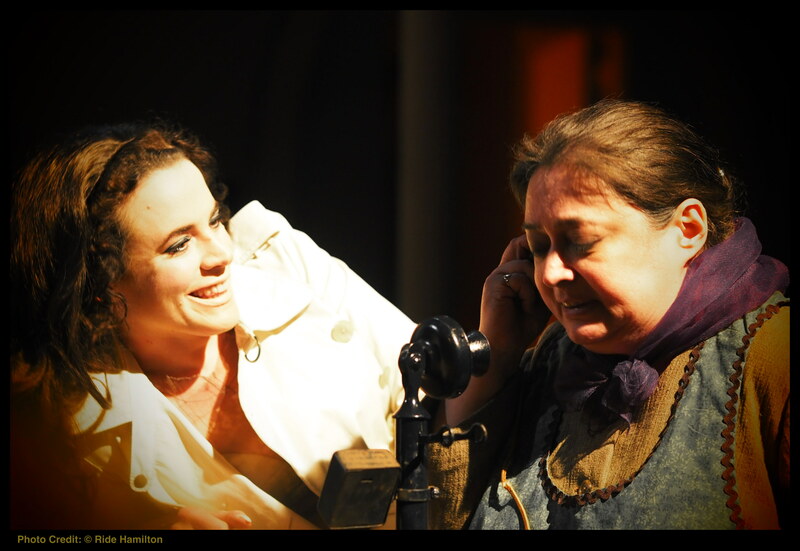 Produced by two of its lead actors, Beth Bartley (Carol Cutrere) and Irene Glezos (Lady), along with the Provincetown Tennessee Williams Theater Festival, this production of Orpheus Descending has been years in the making. Bartley has been a fan and performer of Williams since childhood, and even got accepted to Julliard with Carol Cutrere's monologue about being a "Christ-bitten reformer." After going to the Provincetown Tennessee Williams Theater Festival (generally referred to by those in the know as "Ptown"), she says she was "inspired when director Nick Potenzieri gave a heartfelt speech before our final performance. He said, 'Keep working, keep creating, even if you don't have money to create. Keep acting and creating. The money will come.' When I arrived home in New York I refused to go back to normal life - I needed to keep this artistic creativity and the spirit of the festival in my everyday life. The day I returned to NY, I began to organize a reading of Orpheus Descending. I rented a theatre in the east village and contacted about 15 actor friends and we met one afternoon in early October for a read-thru. We quickly realized that everyone had different editions of the play, making for a clumsy & fascinating read - further igniting my excitement. It was electric and I knew I was onto something, so I organized a second reading, this time for an audience. The reading went smashingly and caused more excitement among the actors, who asked me, 'Beth, are you going to produce this?!' Playwright Delaine Douglas attended the reading and at drinks afterward she told me 'I like who you're conspiring with.' The second reading garnered an invitation to bring the play to the Provincetown festival in 2010, where Orpheus became the central theme for all of the other festival offerings. It was a hit and received an unprecedented return to the festival in 2011." This success was followed by a single benefit performance with the generous help of Alan Rickman in New York in 2012. Next came the full production in New Orleans at the end of March and the beginning of May, which I was lucky enough to see, and now Austin Pendleton is at the helm and the ship of Orpheus Descending has once again come to dock in New York. The work that has gone into producing this little-done Williams play is truly remarkable, and that passion is evident in the performances in this production. Beth Bartley and Randi Sobol. Photo by Ride Hamilton. The performances are what bring great writing to life, and this play is filled with them. Irene Glezos's Lady is strong and vulnerable, played with a fierce passion that is awe-inspiring to watch. Todd d'Amour's Val is our attractive, charming, and rebellious Orpheus, strumming on his guitar and stirring up trouble in a small town where strangers are suspect. D'Amour looks like he's stepped out of the 1950's, and it is a rare treat to see this part played by an actor who can really play music that could charm stones, as was said of Orpheus. But perhaps the most interesting thing about seeing Orpheus Descending on stage is that this production drew my attention to two other characters who had not jumped off the page at me quite as much: Carol Cutrere and Vee Talbott. Beth Bartley's Carol Cutrere is another wild, dangerous, live wire, who threatens the sanctity of a small town. Indeed, Bartley's performance adds dimensions to Carol that are easily missed in a reading: the vulnerability behind her bravado, her desire to prove she's alive, and to find life in a stilted existence. Similarly Mia Dillon's Vee Talbott is a visionary, a seer, but she is also much more than that. Dillon's charming presence reveals the humanity of this character who so often serves as a messenger of doom in most mythical plays. As these characters make their journeys through the play inside of a Christopher Street church, I can't help but think of the journey that has brought them all here. Come and visit and be a part of this myth. Come descend with Orpheus while you watch Tennessee rise. Not that Williams has ever really been forgotten, but every time a great production of one of his lesser known works gets performed, I feel particularly lucky to have seen it. And I think you will too. Please note that the show is two and a half hours without an intermission, but I will say that the momentum is such that it truly flies by. The show runs until May 14th, and tickets can be purchased here or through their Facebook page here.